Asterix (originally Astérix le gaulois) follows the exploits of a village of ancient Gauls as they resist Roman occupation. They do so by means of a magic potion, brewed by their druid, which gives the recipient superhuman strength. The protagonist, the titular character, Asterix, along with his friend Obelix are frequently engaged in hilarious and often action-packed adventures. 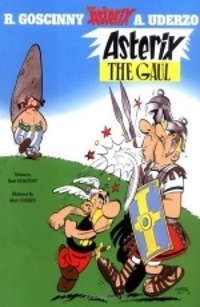 The Asterix series is one of the most popular comics in the world, with the series' 35 volumes having been translated into more than 100 languages. Fans of classic comic strips such as The Adventures of Tintin and Calvin and Hobbes will be delighted by the chaotic adventures of Asterix and his companion Obelix.